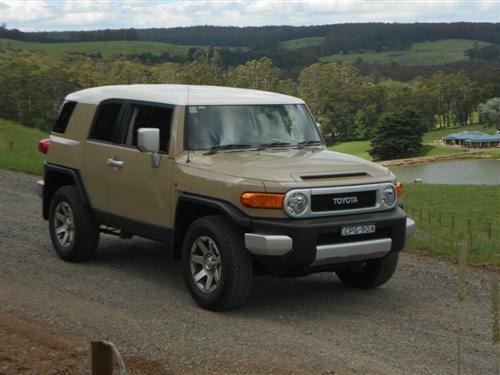 Just what is the attraction with the Toyota FJ Cruiser? Is it the retro or, as some may say, the oddball styling? Is it so ugly that it is beautiful? The FJ Cruiser is very much a case of "beauty is in the eye of the beholder". Now that that has been clarified, lets look at the car - the truck, I mean the SUV, I mean the 4x4. Oh whatever! To set the record straight, let's look at the numbers for a moment. A healthy 2,609 FJ Cruisers were sold last year. This is a good result for a specialist product that comes in just one guise - it is configured with a petrol engine and automatic transmission and comes in one trim level. Our test car, a Sandstorm coloured example, was driven for 624 kilometres across south-eastern Melbourne and the central Gippsland area (around such locations as Erica, Walhalla and Churchill). 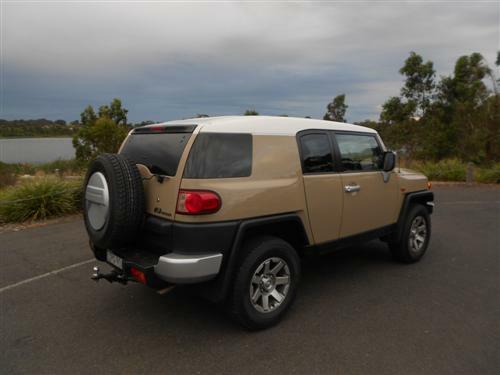 The Toyota FJ Cruiser is priced from $47,990* (plus options, accessories and on-road costs). Yes, the "FJ" is big, you need to climb into it. Once onboard, the big "FJ" is comfortable in the front, a little cramped in the back. Some would say claustrophobic because of the heavy C pillars and the small windows in the rearward hinged back doors. The driving aspects are quite pleasant, especially the ride. The handling is just as you expect of a big SUV, yet I never felt burdened driving it around the urban environment. The rack and pinion steering would feel better if it had a firmer feel, but I am not complaining. Performance is quite pleasing - especially when you consider that this is a big SUV - but be mindful that the big 4-litre engine enjoys soaking up the fuel if you're heavy footed. During our longest outing in the FJ Cruiser we were out for about 10 hours and covered about 400 kilometres in a mix that contained good main roads in suburbia, typical "A" class highways, mountainous roads with plenty of twists and curves and plenty of typical "B" class main roads with two occupants onboard. 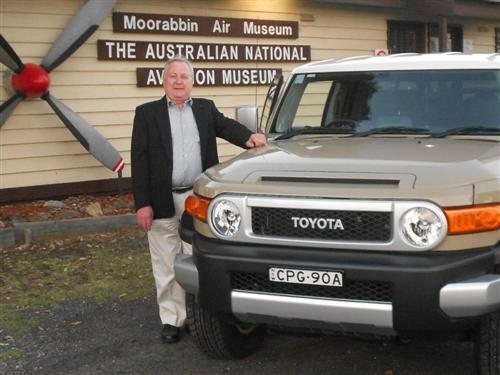 The Cruiser performed well and demonstrated a high degree of satisfaction, typical of the on-road qualities of a big Toyota 4WD. The FJ is easy to drive and manage. Although parking requires a large space but there is assistance by way of a camera whilst reversing - visibility can be a little restrictive, so the camera is very handy. 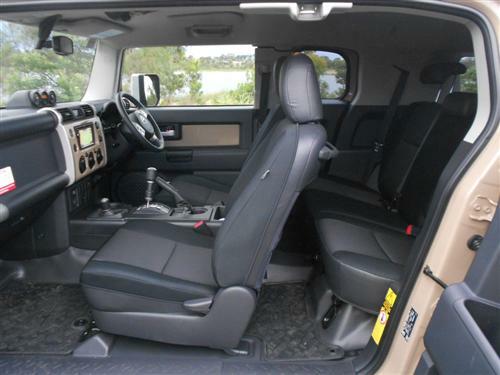 There is plenty of room upfront, so front seat occupants can be comforted by the spaciousness. Seating is quite reasonable and, as indicated, I have been in the saddle for long stretches and managed quite well with just taking the usual breaks for our human needs and to enjoy some photography whilst enjoying the countryside. The boot is huge, so luggage space isn't a problem. If you like camping I suspect there is sufficient room for everything that a family needs for a week-end away (except maybe the kitchen sink and a large bbq if you include these amongst your week-end inventory). 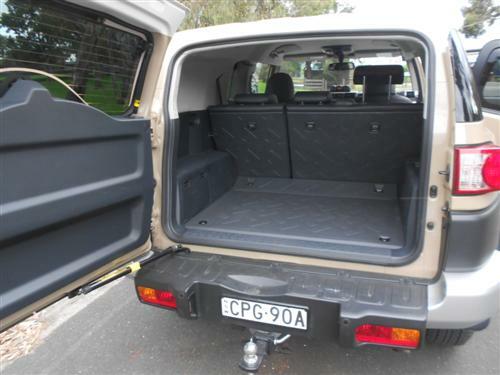 The big rear door (tailgate) is hinged the wrong way for Australian motoring conditions, although it does feature a top-hinged opening window. The FJ features a tough looking easy clean-out interior. Air conditioning and power windows on the front doors are a part of the standard equipment list. 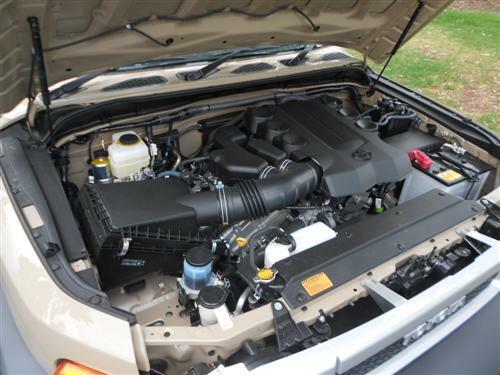 Power comes from a four-litre V6 petrol-fuelled engine. Maximum power is 200kW at 5,600rpm. Maximum torque is 380Nm at 4,400rpm. A five-speed automatic transmission is standard. 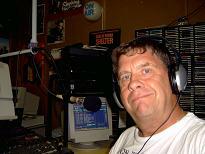 The 4x4 system is the part-time variety. A rear differential lock is standard. The suspension is coils all-around, anti-roll bars front and rear, with a rigid live rear axle. Independent suspension upfront. Five 17" alloy wheels are standard, the spare being mounted externally. Six airbags, vehicle stability control, anti-skid brakes with brake assist and electronic brakeforce distribution are included as standard fitment. ANCAP and EuroNCAP have no published rating for the FJ Cruiser. However, the IIHS in the USA rates the FJ Cruiser as "Good" in three test categories and "Acceptable" in one other test. Ratings are Good, Acceptable, Marginal and Poor. The "Acceptable" rating for the FJ Cruiser relates to roof strength where the FJ Cruiser fell just a litle short, scoring 3.47 whereas a "4" would permit the higher "Good" score. By comparison, the current Jeep Grand Cherokee is well inside the "Good" range with a score of 4.63 in the identical test. The factory indicate the fuel consumption rating is 11.4 litres per 100 kilometres on the combined cycle. The preferred fuel for the "FJ" is premium unleaded (95RON). The fuel tank capacity is 72 litres (main tank) and 87 litres (auxiliary tank), giving quite a good range - if you can afford to fill both tanks! Single-disc in-dash CD player with 6.1" LCD display, MP3 compatibility, AM/FM tuner, two power accessory sockets, Satellite Navigation and Bluetooth are included. Although equipped with optional towing equipment, I did not undertake any towing with the "FJ". 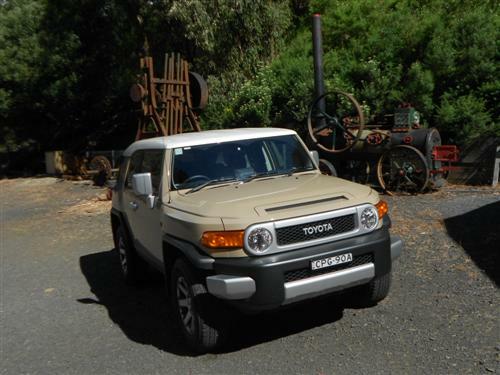 However, to quote the factory numbers a suitably equipped FJ Cruiser can tow a braked trailer weighing up 2,250 kg. My only off-roading in the FJ was on a maintained track so I have nothing to report other than to indicate that I have a good perception of Toyota's off-road reputation. The numbers that may interest off-roaders are - approach angle: 36 degrees; departure angle: 31 degrees; maximum wading depth: 700mm. Three year/100,000 kilometre warranty is featured (naturally, conditions apply). A great feature for buyers is capped price servicing (conditions apply). An understatement would be to indicate that the Toyota FJ Cruiser isn't for everyone. Yet it has that certain appeal that will be appreciated by thousands of buyers each year. I just don't know what that appeal is though! But I found the FJ a pleasant drive around the suburbs and a delight for highway cruising. The fuel consumption is heavier than its diesel competitors so I have the fingers crossed that a new generation will come along at some point in time with a wider range of engine choices. 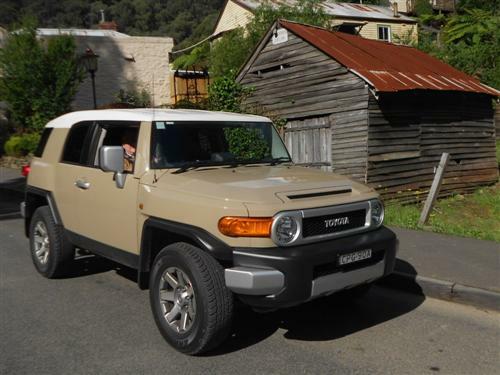 In the meantime, the FJ Cruiser is a worthy larrikin amongst SUVs.